Brighton moved to within two points of the Championship play-off places with a comfortable win over already-promoted Leicester. Stephen Ward headed in the opener before Jesse Lingard nodded in Ward's ball soon after. 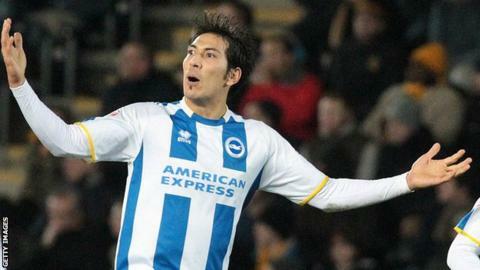 Leonardo Ulloa rounded goalkeeper Kasper Schmeichel for Brighton's third and then headed in Kazenga Lualua's cross. Gary Taylor-Fletcher scored a late consolation from Lloyd Dyer's ball. It was a deserved and comfortable win for a Brighton side who had picked up only two points from their previous five games. It also tainted Leicester City's promotion party as the team celebrated their return to the Premier League in front of their own fans for the first time since securing a return to the top flight. Leicester looked a different side from the one that had not lost in their previous 21 league games - their last defeat having come at Brighton on 7 December. Veteran Kevin Phillips headed wide early on but, after that, Brighton dominated, racing into a two-goal lead in the space of seven minutes. First, Ward headed in from close range and then Lingard was allowed to add a second with a simple finish. Ulloa's lobbed effort landed just wide of goal as Brighton continued to press, before Dale Stephens's flicked shot was cleared off the line. A deserved third arrived just after the hour when Stephens's through ball found Ulloa, who rounded Schmeichel before firing into the net. Brighton became the first team to score four goals past Leicester in a league game this season when Ulloa headed in his second of the game before substitute Taylor-Fletcher struck for Leicester in the final minute. "It was a very poor performance. Unfortunately we had too many individuals who under performed and collectively we have been very poor. "The goals we have conceded were very uncharacteristic of us. They were poor goals. But we looked a shadow of what we have been about this season. "It was really disappointing to put on that sort of performance on what should have been an evening where we were celebrating getting promotion. So that's a big wake up for us." "This was a massive result for us and I could not be more proud of my players for the way they performed. "We have been playing pretty well and were wanting to win against a side going into the Premier League. We wanted to come here and play well but we knew it would not be easy against the a team like Leicester. But we were the better team from the start. "The win has put us in a good position but I only look at the next game and focus on that. I hope the players do the same." Match ends, Leicester City 1, Brighton and Hove Albion 4. Second Half ends, Leicester City 1, Brighton and Hove Albion 4. Corner, Leicester City. Conceded by Stephen Ward. Goal! Leicester City 1, Brighton and Hove Albion 4. Gary Taylor-Fletcher (Leicester City) left footed shot from the centre of the box to the high centre of the goal. Assisted by Lloyd Dyer with a cross following a fast break. Substitution, Brighton and Hove Albion. David López replaces Kazenga Lua Lua. Attempt saved. Andy King (Leicester City) right footed shot from outside the box is saved in the centre of the goal. Lloyd Dyer (Leicester City) wins a free kick in the attacking half. Corner, Leicester City. Conceded by Íñigo Calderón. Offside, Brighton and Hove Albion. Matthew Upson tries a through ball, but Jesse Lingard is caught offside. Substitution, Brighton and Hove Albion. Jake Forster-Caskey replaces Solly March. Corner, Leicester City. Conceded by Matthew Upson. Goal! Leicester City 0, Brighton and Hove Albion 4. Leonardo Ulloa (Brighton and Hove Albion) header from very close range to the bottom left corner. Assisted by Dale Stephens with a cross following a set piece situation. Attempt missed. Wes Morgan (Leicester City) header from the centre of the box is close, but misses the top right corner. Assisted by Gary Taylor-Fletcher with a cross following a corner. Attempt saved. Andy King (Leicester City) header from the centre of the box is saved in the top right corner. Assisted by Paul Konchesky with a cross. Substitution, Leicester City. Gary Taylor-Fletcher replaces Riyad Mahrez. Attempt missed. Kazenga Lua Lua (Brighton and Hove Albion) left footed shot from outside the box is too high. Assisted by Solly March. Attempt blocked. Jesse Lingard (Brighton and Hove Albion) left footed shot from the left side of the box is blocked. Assisted by Stephen Ward. Attempt blocked. Kazenga Lua Lua (Brighton and Hove Albion) right footed shot from more than 35 yards is blocked. Assisted by Jesse Lingard. Attempt missed. Daniel Drinkwater (Leicester City) left footed shot from outside the box is close, but misses the top left corner. Attempt blocked. Riyad Mahrez (Leicester City) left footed shot from outside the box is blocked. Assisted by Daniel Drinkwater with a headed pass. Corner, Leicester City. Conceded by Tomasz Kuszczak. Attempt saved. Wes Morgan (Leicester City) header from the centre of the box is saved in the bottom right corner. Assisted by Riyad Mahrez with a cross. David Nugent (Leicester City) wins a free kick on the left wing. Goal! Leicester City 0, Brighton and Hove Albion 3. Leonardo Ulloa (Brighton and Hove Albion) left footed shot from the centre of the box to the centre of the goal. Assisted by Dale Stephens with a through ball.